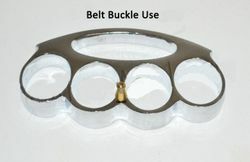 Good quality stainless steel knuckle with belt buckle stud in a Gold color, Silver, Copper and Nickel. 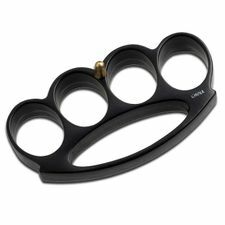 Weighs about 7 oz. 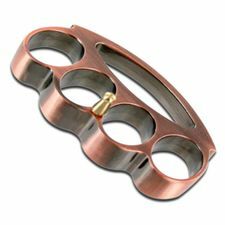 Almost 3/4 inches wide at the knuckle end and tapers down to about a 1/2 inch at the palm end. Belt buckle stud screws in between 2nd and 3d knuckle hole. Carded with product code of H-04L. Made in China.